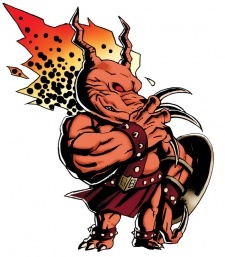 The strongest member of Jadow, codenamed "Inferno Lord." He was sent to fight Joe after the incompentence of the other agents. He developed a grudge on Joe for being referred to a dog when he is clearly a lion, and his fiery mane extinguished in his first defeat by Joe. He's one of few Jadow members to question Alastor's loyalties. When Joe arrived to Jadow HQ, Fire Leo wanted to kill Joe and overpowered him. At the last second, Fire Leo was restianted by Alastor as they fell into the void that surrounds Jadow headquarters. He is later found to have been brought to a land of snow ruled by the ice princess, whom he falls in love with and acts as her knight. He confronts his brother, Frost Tiger, and they reach a stalemate. After the battle, Fire Leo decides to stay with the ice princess, and protect her.